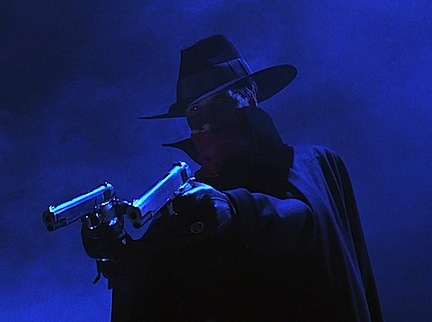 In 1997 Universal entered the fledgling DVD market with four titles, one of them being The Shadow, starring Alec Baldwin as the cloaked crimefighter of pulp and radio fame. The Russell Mulcahy-directed film, released in 1994 to mixed reviews, had previously been made available to collectors in both VHS and laserdisc form. Curiously, the Shadow DVD did not preserve the theatrical version’s aspect ratio of 1.85:1, as did the laser version. Instead, the smaller disc presented a transfer that cropped the image to 4:3 — the dimensions of a typical TV screen in the days before 16×9 sets became common. Serious cineastes and Shadow fans were disappointed, although it’s safe to say that most consumers didn’t care one way or the other. The movie’s sales were respectable but underwhelming no matter what the format, and while the DVD’s inclusion of a transfer intended for pay-cable networks was most likely a mistake, Universal wasn’t about to incur additional expense to rectify the error. Not for a movie that the general public had received with such indifference. When Blu-ray got its big consumer rollout in 2006, I hoped that The Shadow would be among Universal’s early releases in the new high-definition format. I knew for a fact that the studio’s video division had received complaints about the DVD, but I also knew that nobody there had much confidence in the film. Seven years later, we finally have a Blu-ray boasting a new high-definition (1080p) transfer of the original widescreen version. In the interest of brevity I’ll assume that most readers of this blog are familiar with The Shadow and need no recapitulation of the plot. To begin with, I’m happy to report that image and sound quality are excellent, although one could quibble with the color correction of some shots. The opening sequence that takes place in China (filmed in one of my favorite locations, the Alabama Hills of Lone Pine, California) has a yellowish cast. Likewise, during the Cranston-Khan confrontation in the Chinese restaurant, both men seem to have saffron skin. And I noticed that in a few shots Penelope Ann Miller’s lipstick looks more orange than bright red. Such minor tinting anomalies usually demonstrate an overall bias toward the spectrum’s warmer colors, but the blues, browns and greens are rich and vivid. Maybe I’m being too fussy. Don’t get me wrong; this is a fine-looking transfer. But since Blu-ray has a reputation for pictorial superiority, we’re entitled to pick nits now and then. Regarding the movie itself: I’ve always had a love-hate relationship with The Shadow. At its most effective — for example, in the first-act sequence in which The Shadow rescues Dr. Roy Tam — the film will evoke fannish memories of the character at his best, both in the pulps and on the air. Yet Russell Mulcahy’s direction is uneven and the shifts in tone extremely disconcerting. No matter how many times I see this film, I’ll always cringe when Lamont Cranston and Shiwan Khan trade quips about their haberdashery. And am I the only one who thinks Baldwin and Miller exhibit no chemistry in their scenes together? But the thing that’s always bothered me most about The Shadow is its ill-advised attempt to reconcile the differences between the character’s pulp and radio incarnations. For example, if the movie’s Shadow can cloud men’s minds, why does he need to wear the hat and cloak at all? And why, given that Lamont Cranston is established as a handsome man, does The Shadow “morph” into a hawk-nosed figure, recognizable only to those viewers familiar with the pulp magazine’s iconography? That visage is acceptable to readers of the original Shadow stories because Lamont Cranston and Kent Allard were described as having similar facial features. The morphing makes no sense to viewers who aren’t conversant with Shadow lore. Still, Mulcahy’s Shadow has much to recommend it, and I have to admit I’m delighted to finally have a high-definition version in the proper aspect ratio. What I can’t forgive, however, is Universal’s refusal to add so much as a coming-attractions trailer by way of supplemental features. Especially since the studio had some pips at its disposal…. 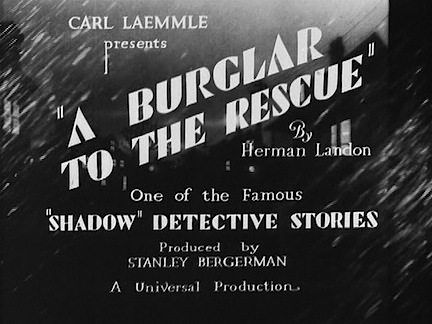 As readers of Blood ‘n’ Thunder have long known, The Shadow made his first screen appearance in a 1931 short subject, “A Burglar to the Rescue,” which was the initial entry in a six-installment series of “Shadow Detective” featurettes produced and released by…Universal Pictures. Unseen for more than 70 years, “Burglar” turned up at a Los Angeles film festival after being found and preserved by Universal. Subsequently the studio unearthed three additional Shadow featurettes; to the best of my knowledge, the whereabouts of the remaining two have not yet been ascertained. But the second short, “Trapped,” was also preserved from original 35mm film elements. It would have cost Universal very little to include “Burglar to the Rescue” and “Trapped” on the new Shadow Blu-ray. Their presence might not have attracted many buyers, but it certainly wouldn’t have discouraged any. And adding the featurettes might very well have been a shrewd marketing move, especially had their historical importance been played up in the disc’s marketing and advertising. 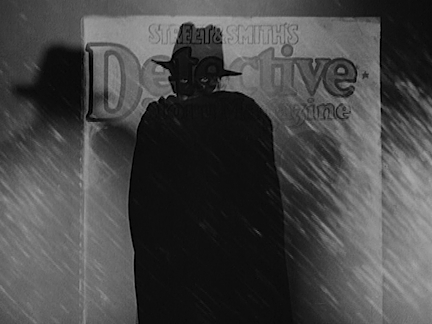 For those who don’t know, the “Shadow Detective” shorts — “two-reelers” with running times of approximately 20 minutes each — utilized the same format of radio’s Detective Story Hour, which debuted in 1930 and had The Shadow as a narrator of mystery yarns adapted from Street & Smith’s Detective Story Magazine. The weekly broadcast was such a hit that the mysterious narrator was fleshed out by freelance writer Walter B. Gibson and given a pulp magazine of his own. The rest, as they say, is history. “Burglar to the Rescue” was produced in New York City, where the radio show originated. Frank Readick, who by this time had made the character a nationwide sensation, lent his sepulchral tones to the celluloid Shadow and in all likelihood also appeared in hat and cloak: The Shadow seen in the frame capture below looks very much like publicity photos taken of Readick in costume to promote Detective Story Hour. The “Shadow Detective” shorts aren’t world-beaters by any means; their historical value far outweighs their entertainment value. But Universal missed a bet by not including at least a couple of them on the Blu-ray.